Filed Under Erik Pieters, Jetro Willems, Manchester United, Netherlands, Stejn Schaars. The injury of Erik Pieters has made way for Willems to shine this year. Picture: The Independent. 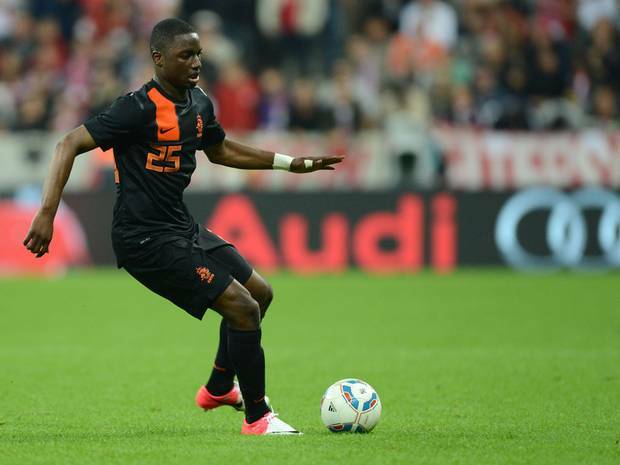 The youngest player in Euro 2012 and possibly one of the most exciting young talents in the competition is 18-year-old Jetro Willems. The PSV Eindhoven left back will wear the number 15 shirt in Poland and Ukraine and is eager to get his side to the final stages after a successful season under his belt that could get remarkably better for the Antillean-decent Dutchman. Manchester United reportedly showed interest in the young defender last January as a long-term replacement for Patrice Evra. Willems was part of the Netherlands squad that won the 2011 European Under 17 Championship and earned a move to the Dutch giants from Sparta Rotterdam. He has since broke into the first team whilst representing Netherlands Under 19s on the way. He only made his full international debut earlier this month in a friendly against Bulgaria. He’s appeared 20 times for PSV last season as well as six Europa League games, providing him with valuable experience against some of the continent’s best and most established players. Stijn Schaars will be Willem’s main competition going into the competition for the left-back position after PSV and Netherlands first choice Erik Pieters was ruled out through injury. He is currently contracted for three years at the Dutch club and would warrant a substantial transfer fee to prize him away. Unfortunately, the video is in Dutch, but if you can understand, take a look at this interview with the youngster himself.